Note: Some of you may take offense at the title of this book, in which case this is not the book for you. But if you’re fine with the title, you may enjoy the book and find it useful. When people talk about their messy homes, they’re often talking about two related challenges: organizing and cleaning. Unf*ck Your Habitat by Rachel Hoffman deals with both of these as part of the ongoing process of creating a pleasant home. Hoffman focuses on creating a “functional and livable home that you aren’t ashamed of or stressed out by, “not one of the “picture-perfect” homes you often see in magazines. And her advice applies to someone living in a dorm room or renting a room in someone else’s home, not just those with their own apartments or houses. We’re disorganized primarily because we have more stuff than storage. There are two solutions: less stuff or more storage. Less stuff is almost always the better option. Your everyday items should live someplace where it’s just as easy to put them away as it is to leave them out. When you’re getting rid of stuff, don’t make it someone else’s problem. … If something is broken, outdated, or no longer useful, you’re just passing the buck on ending its life cycle when you know good and well that it was time for it to get tossed or recycled. Hoffman advocates doing your organizing and cleaning in a series of 20/10s, one or more per day, where a 20/10 is twenty minutes of work followed by a 10-minute mandatory break. But here’s something I really liked: She says that if 20/10 doesn’t seem right for you, go ahead and make it 45/15 or whatever works better. If you have energy limitations, she suggests that 5/15 may work better. And if your physical limitations mean that 5/rest-of-the-day is all you can handle, that’s okay, too. There’s a useful chapter on dealing with roommates, spouses, and significant others who don’t share your cleaning and organizing goals. And the chapter entitled “Emergency Unf*cking” gives a practical plan on how to respond when you need to make your place presentable, fast. 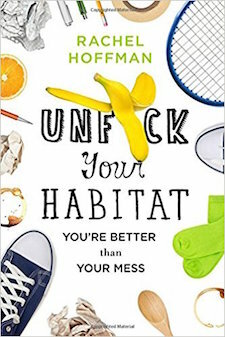 Unf*ck Your Habitat is a quick and easy read. It won’t give you lots of detailed advice regarding how to organize your clothes, your files, etc. But it just might inspire you get going, even when your home feels like a total disaster. Will NEVER buy a book with the “F” word in the title. Good thing it’s actually a 🍌 then! I like it BECAUSE it has f*ck in the title. Seriously, in this culture (I’m in my 50s and not a prude), how does one get through the day without at least muttering the word multiple times?!? There are several books & blogs with the “Unf*ck Your Whatever” concept. I’ve found them mostly helpful, informative, and definitely amusing and entertaining. There’s enough v*lgarity in the world already, isn’t there? We are not amused. I do not read anything that has these vulgar words on the cover nor do I listen to anything or want to listen to such. It turns me completely off. I would not even open the book to see whats inside… It turns me completely off even from reading anything by this author. Will always buy a book with the F word in the title. I love my cook book, WTF to make for dinner. I love my life coach who chants F**k Yes! I love my workout group that gets hype with F**k yea!! Who cares about the title? If she can help me, someone with a diagnosed hoarding disorder, I’ll be happy. All the standard decluttering books are less than helpful for someone in this situation.